I took these pictures of these two shower chairs a couple of months ago, anticipating writing a blog post about them. 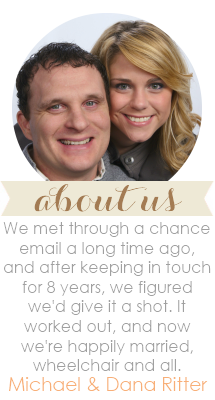 Now, I'm digging the pictures out and writing a blog post. But it's not the post that I thought it was going to be. At all. 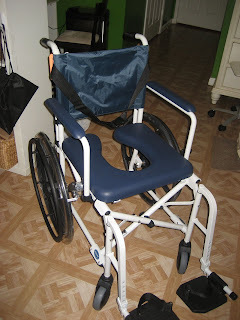 You see, I thought I was going to write all about how happy we were to have this new shower chair, because it is better, lighter, cleaner, and it's not as bad looking. I thought about how wonderful it was going to be to have a shower chair we could fold up and take on trips with us and such. And I thought I was going to tell you about how happy I was to get rid of this old clunker because it was mildewey, and it kept scratching and cutting M's feet with it's jagged edges. And he had to wear flip flops. And the backrest was stretched out and always falling down. I'm actually going to write a blog about something I thankfully only have a couple of, regrets. I regret that I wheeled that old clunker to the dumpster, with a smile on my face, practically before I had all of the plastic off the new one. Because this shiny, sparkly new, lightweight foldable thing is a MESS. I hate it. I curse at it sometimes, even. Because it has taken something away from us, it has caused us to move backwards. This awful situation has been going on for a couple of months now. At first, there were a lot of tears. Out of all four of our eyes. It has caused us to confuse our anger with the situation as anger toward each other. 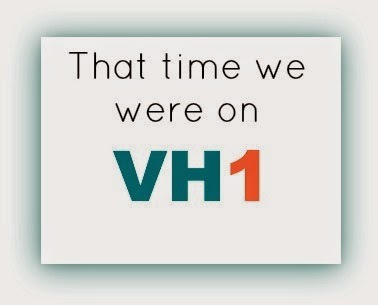 It has been down right awful! Even on vacation. Twice. But, I am glad we were able to fold the stupid thing up and take it with us. So, that is one good thing. 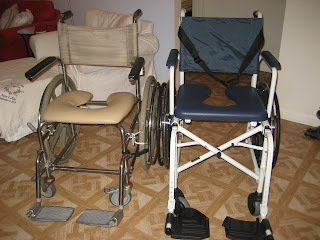 We have been back and forth with the insurance company and the maker of the chair about the chair's horrible design and how, despite the modifications we've made, it just doesn't work for Michael to be able to handle his bathroom stuff independently, and that just doesn't work for our life!! Hopefully we will have a new chair that works much better, very soon. We don't really cry about it anymore. I can only tell you from my perspective, and that is this: it's not necessarily that this situation has gotten any easier, it's just that I've gotten used to it. I've gotten faster at working with this nemesis, I've gotten used to the routine, and breathing through my mouth for an hour or so. So, yeah. Even though I hated that old chair because I thought it looked awful, like an electric chair or something, I wish I hadn't thrown it away. Because as much as I am into the way things appear... In this case, the ugly one was WAY better. I'm really happy for you. Living with disabilities is very difficult, I know this from my own experience. Good shower chair can greatly facilitate your life. 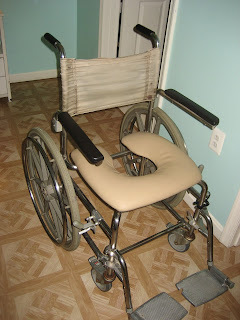 I had a lot of chairs designed for shower, the best I found on this site http://www.bestshowerchairs.com/. I wish you all the best. No one is wheelchair bound; they use it because that is convenient. That is the simple fact. There are all various kind of wheelchair – folding wheelchair, tilt wheelchair, commode chair for shower, standing wheelchairs and so on. People who need wheelchair use it according to their necessity. The modern wheelchairs are innovative and provide great protection and support.